Whether cloudless denim skies are overhead or the weather is a tad more British, this serene oceanfront spa hotel is a breath-taking adult-only escape. From the reed-fringed outdoor pool to the two clifftop hot tubs and sea-view sauna, The Scarlet makes the most of its spectacular coastal location. In fact, every room, chair, table and outdoor cosy daybed faces seaward. 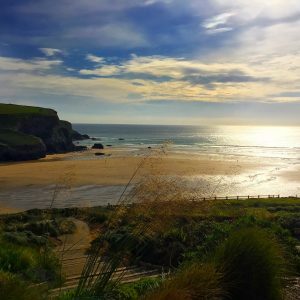 The hotel’s swooping, ergonomic buildings nestle into the hill and occupy an enviable position above the marigold sandy cove of Mawgan Porth. A private eco paradise; wild grasses grow on the flat roofs to further draw the building in to its surroundings. The Scarlet’s award-winning Ayurvedic spa blurs the boundaries between outside and in with windows running almost the entire length of its exterior wall. Guests can relax on outdoor loungers around the natural pool or in canopied couples sofas set among the wild flowers around the cliff top. Inside, the spa’s blissful relaxation room features hanging pods to rock you to a soul-soothing slumber and an array of super-soft floor cushions and chaise longues – all with captivating sea views, of course. Therapists are intuitive and excellently trained and the treatments feel bespoke, picking up on niggles and muscle strains resulting in exquisite soothing of frazzled nerves and aching joints. For glowing skin try the hammam and seaweed scrub. The Scarlet is a luxury hotel with a green heart; natural materials abound, the outdoor pool self cleanses with wild reeds and toiletries and much of the produce in the elegant restaurant is locally sourced and produced by small companies. Wild grasses are used to delineate the private gardens of the garden rooms, to ensure the view remains unobstructed for all and the natural environment is preserved. Fortunately, while sustainability is one pillar The Scarlet builds on, indulgence is another. Champagne is delivered to the cliff-edge hot tubs at a moment’s notice, the cocktails are mixed in the mezzanine lounge with expert skill and you’ll soon not know quite how to exist outside of the cocoon-like hazel-coloured robes. Our advice – don’t rush things at The Scarlet. Enjoy a swim in the indoor or invigorating outdoor pool, relax the muscles in the sea-view sauna and call for one of a zillion loose leaf teas that will be brought to guests piping hot anywhere, anytime around the hotel and recline in one of the rocking pods before your treatment. The spa will tailor a guest’s ‘spa journey’ as one size and type of treatment doesn’t always fit all. Natural products, clays and oils for the basis of many Ayurvedic therapies and the Bedouin-tented massage rooms are as soporific as it gets. For spa escapes with your favourite someone, the hotel’s new Bells & Whistles break is the ultimate three-night stay, and includes all of the best Scarlet moments from cliff top hot tubs with champagne cocktails and breakfasts in bed to individually tailored spa journeys inspired by Ayurvedic principles. Head down to The Scarlet’s restaurant just before sunset to enjoy the best of the panoramic views. Cornish ingredients form the cornerstone of the menu with the sommelier and chefs working hard to build long-term relationships with small, artisan producers. Classic English dishes are elevated with European twists and fresh fish and local beef is always a highlight. Given the opportunity, the hugely knowledgeable sommeliers will suggest unusual wines and regions from the varied wine list ­– follow their lead; the artisan and biodynamic wines and lesser known regions proved sumptuous. With Padstow 20 minutes up the coast, offering just about every conceivable pasty flavour and the Rick Stein hub of fish restaurants and Watergate Bay to the South, The Scarlet is a perfect foodie weekend base camp. Jamie Oliver’s Fifteen restaurant is a good lunch spot before a beach walk on the wide expanses of Watergate Bay. The quirky light-filled restaurant overlooks the surf and hardy diners can even hike back along the South West Coast path to The Scarlet. Room rates from £240 per night based on double occupancy and includes breakfast, taxes and fees. Email [email protected] or call 01637 861 800.